At the well she meets a stranger, a Jew, an outsider just like her. Jesus asks her for a drink of water. The woman is surprised and tells him so. She does not mince her words: ‘How is it that you, a Jew, asks a drink of me, a woman of Samaria?’ They become involved in a deep personal and theologically tinged conversation. The Brazilian artist, Alexandre Lettnin, has captured this encounter in a way totally his own. When he lived in Europe and as a foreigner felt lonely and quite unhappy there. Lettnin was moved by the loving attitude of Christ towards the woman: Jesus knows her hardships, pain, weaknesses and sins and wants to free her from them. 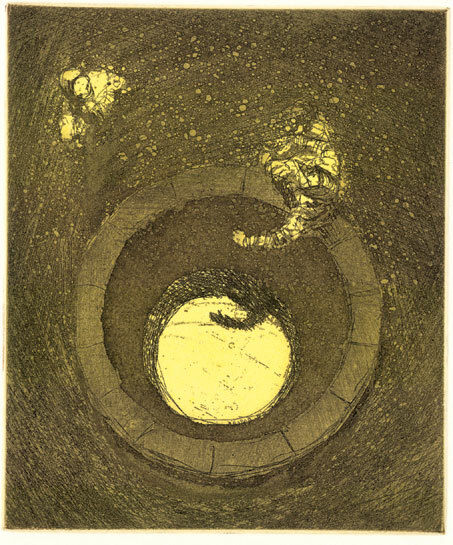 Lettnin has reduced the setting of the conversation in his etching to its essence. We only see the woman, the well and Jesus. The woman is just a small and skinny little puppet who, suspicious and wounded as she is, keeps Jesus at a distance with her assertive questions. Jesus at the other hand bends towards her, full of attention, making an inviting gesture. Lettnin has opted for a ‘God’s eye view’. We see the scene from above, as God sees it from heaven. God sees us standing in the dark, while at the same time seeing the light he wants to lead us towards. That is what this biblical passage is about. For Jesus also sees this woman standing in the darkness and wants to draw her into the light. He sees what she is like, but also what she could be. Jesus offers this thirsty woman a new life. He says: ‘The water that I give will become a spring of water gushing up to eternal life.’ In the print the water in the well reflects the light of the sky, which contrast with the dark that is enveloping the woman. At the same time we see the hand of Jesus mirrored in the water. The way to the living water and the light is Jesus himself. The well is circular, which refers to eternity - without beginning or end, always continuing. Thus life and death are juxtaposed: the woman with her hollow eyes and skull-like face over against the round well with Jesus’ welcoming hand above the water, which forms a passage to the light and eternal life. This eternal life includes a new life here and now. Jesus offers the Samaritan woman inner restoration: thirst quenching, purifying, abundantly bubbling water through which she can progressively come to flourishing. At the end of their conversation the woman has lost her fear and runs towards her fellow villagers to openly testify about the coming of the Messiah. No wonder the artist has suffused the print with a warm soft yellow glow. Alexandre Lettnin: Living Water, Paris, 2000, etching and aquatint on Salland paper. Marleen Hengelaar-Rookmaaker is ArtWay’s editor in chief.